When you are 11-12, girls aren’t really much of a distraction. This lets you throw the full weight of your passion into more scientific pursuits. For me, this was my rockets. Having perfected the rocket fuel that was to lift me above the ordinariness of carbide cannons and other children’s toys, I was ready to take my rocketry to the next level. Over the next few months, I experimented with different rocket bodies made from many different substances. I created special wooden nozzles for the rockets that would give greater compression and lift to the rockets. I experimented with different wing designs. I tested different mixes for the rocket fuel, including powder fuel vs. solid fuel. All of these unique rocket designs had one thing in common, which my mom summed up rather well. “They are just sticks of dynamite with fins glued on,” she said. 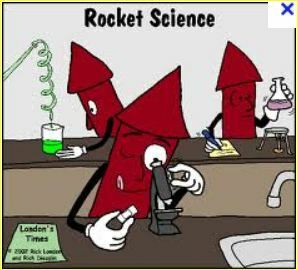 My rocket production laboratory was actually a mass production assembly line that would have impressed even Henry Ford. I prepared everything I needed to build 3-4 rockets at a time. With enough saltpetre and sugar, I was sure I could reach the moon. The rocket design changed over time, as you might expect. I eventually settled on a process that involved cutting a wooden dowel into two pieces. The first piece was sharpened to a nice point to ensure minimal air resistance. The second dowel had a hole drilled through the center, which was a technique I designed to increase the rocket’s thrusting power. Now the rocket body presented something of a challenge, since I had long since run out of that cool little cardboard tube. But I discovered the paper my dad occasionally brought home from the paper mill was exceptionally strong. I found that I could take a few sheets of the paper to roll them into a tube. I used the two dowels as my guide to get the paper as tight as possible. I then used tiny nails to attach the paper to the nose cone dowel. I had to wait until later to nail the nozzle section in place (after the rocket was filled with fuel). Even the wings were a new design. Basically, this was a triangle folded in half so the rocket was nestled in the “V”, providing it with two points of contact for the glue. To keep the wing stabilized, I designed a second smaller triangle wing that fit into the larger wing to provide additional stability. It was an engineering marvel. When the glue had dried, I filled the rocket with my enhanced fuel. When it was full, I carefully pounded the nails through the rocket’s paper body attaching the nozzle dowel. The job was nearly complete. I still had to add more rocket fuel to fill up the hole in the dowel because I still hadn’t solved that fuse problem. Now, I have to admit what my mom said about my rockets was mostly true. So you can imagine all the time I spent picking up small bits of paper that had been blown all over our driveway and lawn. But I wasn’t discouraged. I knew it was just a matter of time before I got it right. And besides, my reputation for rocketry was becoming legendary among my friends. They had even started calling me One-Match-Steve. All my friends were of the stick-the-match-sorta-close-and-then-run-away-as-fast-as-you-can type. 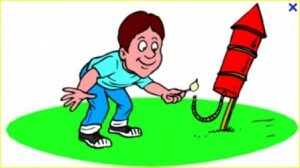 I, on the other hand, was the only kid stupid enough to hold the match steady until the rocket had started burning. But it didn’t matter. I wore my new nickname with pride and dignity. Eventually I developed the Wanderer Class of rockets. They had smaller fins and less compression on the exhaust, which seemed to make them less likely to explode. 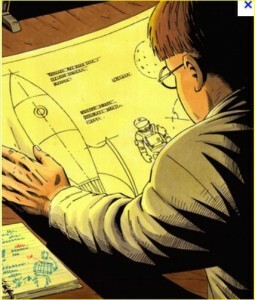 Even today, I remember with great fondness the rocket I had called Wanderer II. It had a revolutionary new wing design, and I had altered the basic design a bit. My friend Keith was there for moral support. Wanderer II did not disappoint us. It got off to a great start by not exploding on the launch pad. This alone guaranteed it shelf space in my Rocket Hall of Fame. There might have been more entries, but piles of shredded paper didn’t seem to impress anyone. After all, I had my standards. The great Wanderer II continued to rise, reaching a height of approximately 20-25 feet above the ground. In my mind, this baby was not only in the Hall of Fame, it was the leading candidate to become the Hall of Fame centerpiece. I would write a book about it, rivaling anything Goddard had written. People would come from everywhere to see how I had done it. And if NASA wanted a few pointers, well that was OK with me too. That was when things took a turn for the worse. More precisely, the rocket decided it had enough of this “up” stuff and decided to try a little “sideways” stuff. It didn’t like that very much so it quickly switched to “down” stuff and then “over” and “back” stuff. I remember marveling at what an interesting display of zigs and zags was taking place before my eyes. Somewhere out of the corner of my eye, I was aware that Keith was running at top speed in the opposite direction. But I couldn’t be bothered with that now. This was history in the making. I almost forgot to move when one of the zags started heading straight at me. But at the last second, a new zig forced it up. It got about 25 feet up when it began a new maneuver. This one I call a spin-in-place. You often have to develop a new vocabulary to describe the varied takeoff sequences, especially if you haven’t quite worked out some of problems with the wings. So naturally my journal is full of technical terms like “spin-in-place”, “zig zag maneuver”, “twisty”, “shaky”, and “wabbly”. 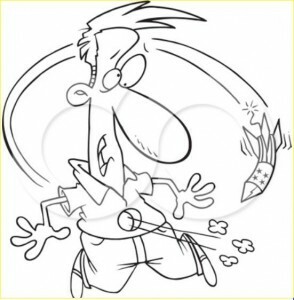 The spin-in-place maneuver seemed last quite a while. The tail of the rocket just went around and around. That was the last thing I remember before the explosion. Suddenly, Wanderer II had vanished from the earth. The only evidence of its departure being those darn little pieces of paper and cardboard that came fluttering down. It looked like he wasn’t Hall of Fame material after all. But no matter. My career had just begun. And the perfect rocket was yet to be made. And I was just the kid to do it.